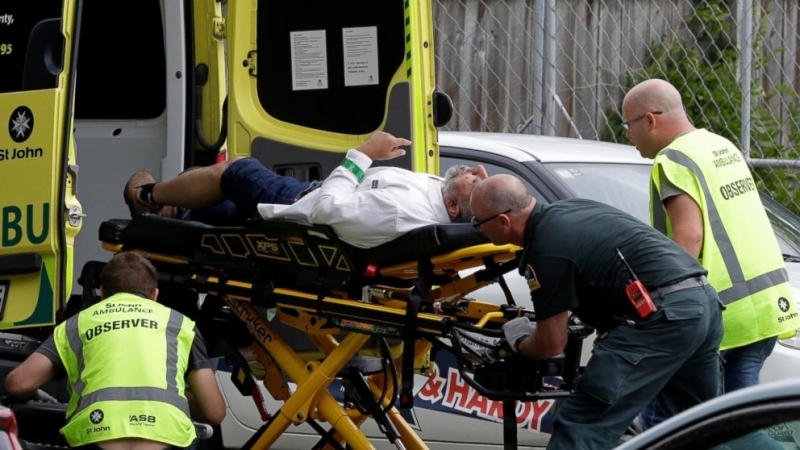 Political leaders from across the world continue to express their condemnation at the deadly shootings at two mosques in New Zealand on March 15 that claimed 49 victims and at least 20 wounded. Turkish President Recep Tayyip Erdogan has strongly condemned two deadly mosque shootings in New Zealand on Friday and called twin mosque attacks 'deplorable act', 'latest example of rising racism and Islamophobia'. "I strongly condemn the terror attack against the Al Noor Mosque in #NewZealand and Muslim worshippers," Erdogan said on Twitter. Erdogan wished God's mercy upon the victims of the shooting and a speedy recovery to the wounded. "On behalf of my country, I offer my condolences to the Islamic world and the people of New Zealand, who have been targeted by this deplorable act - the latest example of rising racism and Islamophobia," he added. Turkey also urged the world to stop the "Islamophobic fascist terrorism" after the armed attack at two mosques in New Zealand. "Attack on two mosques in New Zealand shows the point where Islamopfobia, Muslim hostility reached," Ibrahim Kalin, Turkey’s presidential spokesman, said on Twitter. Kalin strongly condemned "the fascist terrorist attack" and wished God's mercy on those brutally killed while practicing their religious duties. "This cowardly act shows how anti-Muslim rhetoric and hatred leads to murderous acts. The world must break its silence over Islamophobic hatred. We have seen many times that Islamophobic rhetoric against Islam and Muslims have turned into a perverse and murderous ideology," Kalin said. Turkey's presidential communications director Fahrettin Altun also condemned the armed attack on the mosques. "I condemn in the strongest possible terms today’s terror attack in #Christchurch," Altun said. He also said that his thoughts and prayers are with the victims and their loved ones. "This is a reminder that a house divided cannot stand: it is time to unite against all forms of terrorism," Altun urged. Russian President Vladimir Putin has joined his voice to those of world leaders in condemning the mass shootings in New Zealand city and sent his condolences to Prime Minister Jacinda Ardern. "The attack on peaceful civilians who gathered for prayer shocks with its cruelty and cynicism. I expect that all those involved in this crime will receive the punishment they deserve," the Russian leader said as published on the presidential website on March 15. Ukrainian Foreign Minister Pavlo Klimkin has denounced deadly shootings at two mosque attacks in Christchurch. "We stay together with the people of New Zealand in the wake of the heinous mosque attacks in #Christchurch. My thoughts are with all affected by this sickening act of violence and hatred," Klimkin tweeted in English. Indonesia, the world's biggest Muslim-majority country, strongly condemned the shooting as authorities were checking on whether any of its citizens were among the victims. "I am deeply saddened by this uncivilized act, which goes against humanistic values and took the lives of civilians," he said in a statement. "I blame these increasing terror attacks on the current Islamophobia post-9/11 where Islam & 1.3bn Muslims have collectively been blamed for any act of terror by a Muslim. This has been done deliberately to also demonize legitimate Muslim political struggles," he added. What happened at the New Zealand mosques? Australian man Brenton Tarrant, 28, published 'The Great Replacement' the morning before opening fire at two mosques in Christchurch, on New Zealand's south island. As of now 49 people have been killed in the attack, with more than 20 also in hospital in severe conditions. Police have so far arrested three men - including Tarrant - and a woman, according to Daily mail. The chilling manifesto reveals his grievances, why he picked the mosques in Christchurch and how he was inspired by Norway mass killer Anders Behring Breivik, who killed 77 in 2011. 'I have read the writings of Dylan Roof and many others, but only really took true inspiration from Knight Justiciar Breivik,' he wrote. Tarrant's reference to Breivik as a 'Knight' relates to the Norwegian's support for the Knights Templar - an extremist Christian group of specialist fighters from the 12th century. Tarrant also claimed he had been inspired to carry out the attacks as 'revenge for the enslavement of millions of Europeans taken from their lands by the Islamic slavers’ and ‘to directly reduce immigration rates to European lands by intimidating and physically removing the invaders themselves’. 'I am just a regular white man, from a regular family. Who decided to take a stand to ensure a future for my people,' he wrote. Daily Mail Australia understands Tarrant grew up in Grafton, in northern New South Wales, where much of his family still lives. In the manifesto Tarrant said that he especially hated Muslim converts that turn their backs on their ‘heritage’, ‘cultures’, ‘traditions’ and ‘became blood traitors to their own race’. He also said that he had 'little interest in education' and 'did not attend University as I had no great interest in anything offered in the Universities to study'. The man said he initially planned to target a mosque in Dunedin, but changed to the Al Noor and Masjid Mosques because they had 'far more invaders'.